One of my favorite things about cooler weather is layers. My signature winter outfit includes jeans, a blouse, top or T and a cardigan sweater (sometimes a hoodie). Then comes the necklaces. At least two. And now that I have a growing collection, it is so much fun pairing them up. Bottom right: Yellow enamel necklace by Lonesome Dove Designs and bottom one made by me. I have some BIG pendant necklaces in the works and I have been testing them out. So far, I love them, but they won’t be ready til the new year. 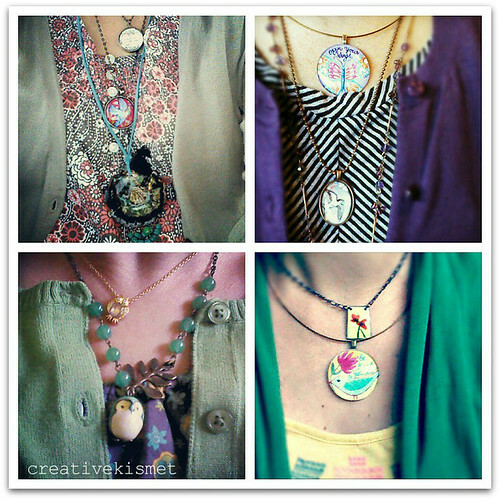 great idea…..i have too many necklaces and too little necks…..gotta try this!! !